If you run an in-house affiliate marketing programme then you will need a contract between you and your affiliates that not only sets out the commercial terms of the deal (such as levels of commission), but which also protects your business, from problems such as false claims of sales, inappropriate use of your content or brand, or disclosure of confidential information. 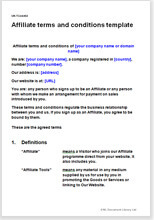 This template will help you create a set of affiliate terms and conditions that should do exactly that. It is easy to adapt to suit exactly how your affiliate programme works, regardless of what you sell, the basis on which you pay commission (e.g. sales or referred traffic volume), or how many affiliates you will have. Are these affiliate terms and conditions suitable for your business? This template is suitable for businesses that operate an affiliate scheme "in-house", that where the programme is run by the business and not a third party affiliate network scheme. If you use self managed software, this template is likely to be suitable. offer a percentage of affiliate sales to second level "super" affiliates who find other affiliates for you. This template can be adapted easily for all of those options. If there are any you do not need, they can easily be deleted. you are more likely to present yourself to potential affiliates as modern, friendly and professional - a business with which they feel comfortable to work. The law in these T&C is largely common law that deals with the basics of contracts: offer, acceptance, price and payment, provision of service, liabilities and risk. That means that, by and large, you can set the commercial terms you want. Our guidance notes will tell you what you can change safely, and what we don't advise changing. Terms and conditions form a contract between you and your affiliates. Just as you place T&C for sale of goods or services on your site and have customers clicking to accept them before sale, these terms should be placed on a page on your site which visitors will read before accepting to become an affiliate. By using the same terms for all affiliates, rather than individual contracts for each individually, you reduce legal administration costs and can change the terms more easily. We have a lot of experience with affiliate programmes and software. We developed our own (now commercially available) affiliate software to be able to run the Net Lawman affiliate programme. This document reflects how modern affiliate programmes (and the software that runs them) work and incorporates our many years of experience of them. other miscellaneous legal provisions to protect your interests.